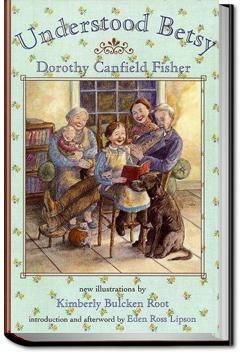 Understood Betsy is a 1916 novel for children by Dorothy Canfield Fisher. The story tells of Elizabeth Ann, a 9-year-old orphan who goes from a sheltered existence with her father’s aunt Harriet and cousin Frances in the city, to living on a Vermont farm with her mother’s family, the Putneys, whose child-rearing practices had always seemed suspect to Harriet and her daughter. In her new rural life, Elizabeth Ann comes to be nicknamed “Betsy,” and to find that many activities that Frances had always thought too demanding for a little girl are considered, by the Putney family, ordinary expectations for a child: walking to school alone, cooking, and having household duties to perform. . . .She blew the light out and moved over a little closer to Elizabeth. Ann, who immediately was enveloped in that delicious warmth. The kitten curled up under the little girl's chin. Between her and the terrors of the dark room loomed the rampart of Aunt Abigail's great body. Elizabeth Ann drew a long, long breath ... and when she opened her eyes the sun was shining in at the window. I am such a big softie. This morning, Isaac and I just finished reading Understood Betsy together (again). This is like totally some kind of Montessori school propaganda, those bastards!! It was better the second (or is that the third?) time through, and really seemed to engage my 7yo son as well!